BACKGROUND AND OBJECTIVE: Patients with a clinical diagnosis of neurodegeneration with brain iron accumulation (NBIA, formerly called Hallervorden-Spatz syndrome) often have mutations in PANK2, the gene encoding pantothenate kinase 2. We investigated correlations between brain MR imaging changes, mutation status, and clinical disease features. METHODS: Brain MRIs from patients with NBIA were reviewed by 2 neuroradiologists for technical factors, including signal intensity abnormalities in specific brain regions, presence and location of atrophy, presence of white matter abnormality, contrast enhancement, and other comments. PANK2 genotyping was performed by polymerase chain reaction amplification of patient genomic DNA followed by automated nucleotide sequencing. RESULTS: Sixty-six MR imaging examinations from 49 NBIA patients were analyzed, including those from 29 patients with mutations in PANK2. All patients with mutations had the specific pattern of globus pallidus central hyperintensity with surrounding hypointensity on T2-weighted images, known as the eye-of-the-tiger sign. This sign was not seen in any studies from patients without mutations. Even before the globus pallidus hypointensity developed, patients with mutations could be distinguished by the presence of isolated globus pallidus hyperintensity on T2-weighted images. Radiographic evidence for iron deposition in the substantia nigra was absent early in disease associated with PANK2 mutations. MR imaging abnormalities outside the globus pallidus, including cerebral or cerebellar atrophy, were more common and more severe in mutation-negative patients. No specific MR imaging changes could be distinguished among the mutation-negative patients. CONCLUSION: MR imaging signal intensity abnormalities in the globus pallidus can distinguish patients with mutations in PANK2 from those lacking a mutation, even in the early stages of disease. NBIA is a heterogeneous group of disorders characterized by neurodegeneration and excessive iron deposition in the basal ganglia. Patients generally fall into 2 clinical categories: (1) early onset, rapidly progressive (classic) disease or (2) late onset, slowly progressive (atypical) disease. Recently, the defective gene that causes most cases of NBIA was identified.4 This gene, called PANK2, encodes a pantothenate kinase that is important in the biosynthesis of coenzyme A from vitamin B5. PANK2 was shown to be mutated in all cases of classic NBIA and in one third of cases of atypical disease,3 and these patients were designated as having pantothenate kinase-associated neurodegeneration (PKAN, OMIM no. 234200). No genetic or pathogenic basis for the remainder of atypical NBIA cases has been determined. In NBIA, the diagnostic MR imaging feature is signal hypointensity in the globus pallidus on T2-weighted imaging, which correlates with the accumulation of iron that is observed on pathologic examination. 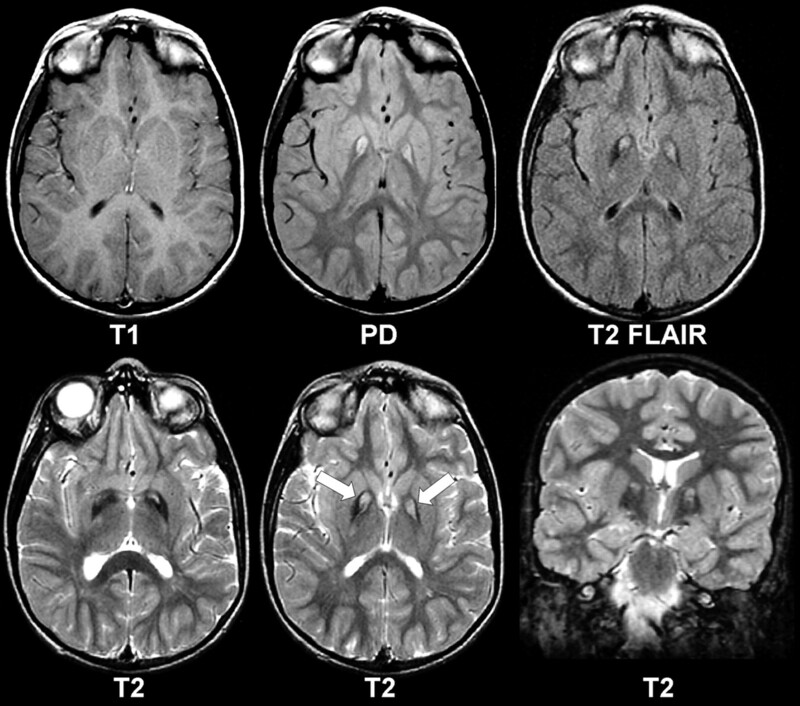 A range of other brain MR imaging changes have been reported in patients with this diagnosis, including the pattern designated as the eye-of-the-tiger sign, which combines high signal intensity in the center of the globus pallidus interna with low signal intensity in the surrounding region.2 We have shown that there is an absolute correlation between the presence of a mutation in PANK2 and the eye-of-the-tiger sign3; that is, all patients with the PANK2 mutation have this MR imaging pattern, which also is not seen in any mutation-negative patients. In the current study, we investigated correlations between brain MR imaging changes, PANK2 genotype, and clinical disease features. Brain MR imaging studies were collected from NBIA patients after informed consent for a protocol that had been approved by the Institutional Review Boards of Oregon Health & Science University or University of California San Francisco. The MR images were interpreted by 2 neuroradiologists who were blinded to patient disease status and all clinical information except age, which was sometimes available from the films. 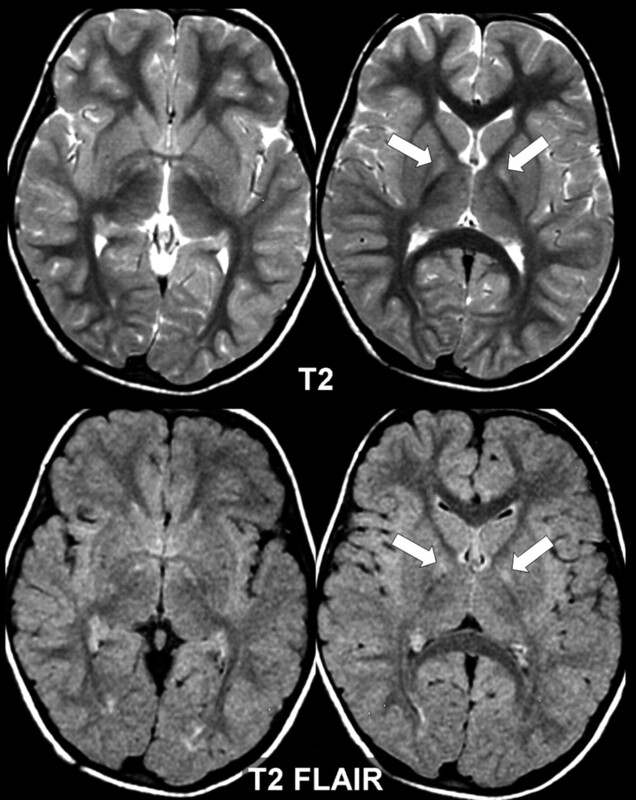 Imaging data that were collected for this study included magnetic field strength in Tesla, pulse sequences used, signal intensity (scored as hypointense, isointense, or hyperintense) in specific brain regions (including globus pallidus interna and externa, substantia nigra, thalamus, putamen, and caudate) on T1- and T2-weighted studies, presence of the eye-of-the-tiger sign, presence and location of atrophy, presence of white matter abnormality, and enhancement on gadolinium contrast study. We operationally defined “T2-weighted” as a technique with repetition time of >2000 ms and echo time of >60 ms, based on a conventional spin-echo, fast spin-echo, or turbo spin-echo pulse sequence. “T2*-weighted” sequences were defined as those with low flip angles acquired with a gradient echo technique designed to accentuate T2* susceptibility effects. Because this was a retrospective collection of clinical cases, the exact MR parameters varied from site to site. The readers’ analysis reported here took into account an appreciation of sequence, timing parameters, and field strength in determining normal versus abnormal signal intensity characteristics. It is important to recognize that the imaging findings described were robust and not dependent on subtle changes in sequence parameters or even field strength. The examples shown in the figures are representative cases done at 1.5T by using sequences and parameters widely used throughout the world. Some of the MR images were previously reviewed for the presence of the eye-of-the-tiger sign and reported.3 PANK2 genotype data were obtained by using published methods.4 Statistical analyses were performed by using an on-line tool (http://www.georgetown.edu/faculty/ballc/webtools/web_chi.html). Radiographic data from 66 independent studies were collected on 49 patients who carried the diagnosis of NBIA, including 2 studies from each of 13 patients and 3 studies from 2 patients each. Fourteen image sets included only T2-weighted scans. The earliest studies were performed in 1988 on a 0.3T unit. Two studies were done on 0.5T scanners, and the remainder (94%) were done on 1.5T units. Patients ranged in age from 1.5 to 59 years at the time of the examination. Of the 49 persons studied, 29 patients from 21 families had mutations in PANK2. All patients with a PANK2 mutation demonstrated a specific pattern on T2-weighted imaging called the eye-of-the-tiger sign,2 which was evident on studies performed on 0.3T, 0.5T, and 1.5T units (Fig 1). This sign, which consists of T2- signal hypointensity in the globus pallidus with a central region of T2-hyperintensity, was not observed in studies from any of the 20 patients without the mutation. Instead, these patients had only signal hypointensity in the globus pallidus. Eye-of-the-tiger sign (arrows). This 10-year-old boy with the PANK2 mutation shows MR features characteristic of PKAN. The T1-weighted images appear normal, but high signal intensity can be seen in the globus pallidus on proton attenuation (PD), T2-weighted fluid-attenuated inversion recovery (FLAIR), and T2-weighted images in both the axial and coronal planes. With increasingly heavier T2 weighting (PD<FLAIR<T2), there is increasingly conspicuous T2 hypointensity at the periphery because of the magnetic susceptibility effects of excess iron. In 5 patients with the mutation who had multiple studies, the earliest MR imaging change was isolated T2 signal hypointensity in the globus pallidus interna (with isointense globus pallidus externa on T2 studies and isointense globus pallidus interna on T1). This finding occurred at a mean age of 3 years and consistently predated the appearance of a hypointense globus pallidus externa (Fig 2). Again, this early abnormality was not observed in images of any mutation-negative patient. In all cases, patients with isolated bright globus pallidus interna on T2 images developed the eye-of-the-tiger sign within 3 years of the earliest MR imaging change. Four and a half years was the earliest age at which the eye-of-the-tiger sign was observed in any mutation-positive patient. The oldest patient in this series with the eye-of-the-tiger sign was 59 years at the time of her scan. The size of the region of signal hypointensity did not clearly correlate with age or duration of symptoms. Of the 5 gadolinium contrast studies performed in patients with a mutation, none showed lesion enhancement. Subtle early changes in NBIA. This 3-year-old girl shows slight T2 hyperintensity (arrows) only on T2 and FLAIR sequences. There are no signs of excess iron deposition. The clinical course was progressive, and a PANK2 mutation was present. Among patients with a mutation, 30 of 37 scans (81%) showed signal hypointensity in the substantia nigra pars reticulata on T2 imaging, and the remainder showed nigral signal hypointensity. The mean age of the patients with a PANK2 mutation with hypointense nigra was 25 years, compared with 13 years for those with signal hypointensity in this region (P = .05). Among patients without a mutation, 17 of 29 scans (58%) showed hypointense nigral region on T2 imaging, and the remaining 42% showed signal hypointensity in this region. Mean ages for these 2 groups did not differ significantly (17 versus 15 years). Other MR imaging changes were seen in a minority of patients with a mutation. Mild cerebellar or cerebral atrophy was identified in 8 of 29 patients (28%). The thalamus, caudate, putamen, and white matter showed no abnormalities in any studies from patients with a mutation. In contrast, patients without a mutation were much more likely to show additional brain abnormalities, especially atrophy of the cerebellum or cerebrum (12/21, 57%) (P < .05), which was moderate to severe in 11 cases (92%), and white matter disease, which was observed in 6 of 21 cases (29%). Because a broad range of clinical features can occur in NBIA, brain MR imaging findings will most often lead clinicians to this diagnosis. In the past, radiographic evidence of a high amount of basal ganglia iron was sufficient to diagnose NBIA, though the diagnostic implications of associated MR imaging changes remained uncertain. With the identification of the major causative gene, we now are able to distinguish PKAN from non-PKAN NBIA by molecular diagnosis. Previously, we reported a striking correlation between the presence of mutations in PANK2 and the eye-of-the-tiger sign on brain MR imaging,3 an observation that is supported in the current analysis. Furthermore, we describe here the earliest neuroradiographic changes seen in patients with a mutation. Isolated high signal intensity on T2-weighted images of the globus pallidus interna is consistently observed in early studies and appears before signs of T2 hypointensity related to iron accumulation. Thus, this change, when present in a patient who has the supporting clinical features but lacks the eye-of-the-tiger sign, is sufficient to prompt PANK2 molecular diagnostic testing. Although clinical features of PKAN may predate the appearance of the eye-of-the-tiger sign, it is important to note that this is not uniformly true. We reported 2 families in which the eye-of-the-tiger sign was observed in presymptomatic siblings of affected patients.5 Hence the timing of the appearance of characteristic brain MR imaging changes in relation to the progression of clinical disease seems to be inconsistent. In PKAN, our observation that the radiographic changes evolve over time are consistent with our current hypothesis of disease pathogenesis.4 Deficiency of PANK2 is predicted to lead to the accumulation of cysteine-containing neurotoxic compounds that cause tissue damage and edema in certain highly sensitive brain regions, though the basis for this sensitivity is not fully understood. This tissue damage leads to excess iron accumulation in normally iron-rich brain structures, a process that is suspected to be secondary in the pathogenesis of this disease. Thus, one would predict that radiographic evidence of tissue edema would precede that of iron accumulation, which we now show to be the case. A second notable observation from this study is the late appearance of radiographic evidence of iron deposition in the substantia nigra pars reticulata in PKAN. This feature was widely reported in postmortem pathologic studies, which usually were done on patients who were at the end stage of their disease.6 A high level of iron in the substantia nigra has been included among the diagnostic criteria for NBIA7; however, we have shown that it may not be evident by MR imaging early in the course of disease. T2* effects related to abnormal iron accumulation were clearly seen at all field strengths and (as expected) were accentuated with greater degrees of T2 or T2* weighting. None of the present cases had imaging performed at 3T, which would be expected to show even greater signal intensity drop-out because of inherently greater T2* effects. As is widely appreciated, the amount of signal intensity loss in the globus pallidus and other iron-containing structures (in both health and disease) varies according to field strength, pulse sequence, exact technique, and even reading conditions, such as the window and level chosen for filming or reading. All of these considerations need to be taken into account when analyzing a case for suspected NBIA. One limitation of this study is that we did not include normal MR imaging controls or patients with other neurologic diseases related to the basal ganglia. Normal aging and many pathologic conditions have been linked to mineralization of the basal ganglia, and this would result in hypointensity on T2-weighted images. Some toxic or metabolic conditions can also cause necrosis of the globus pallidus. The combination of mineralization and central necrosis could therefore occur in the globus pallidus in other clinical conditions. For example, an eye-of-the-tiger sign might be simulated in an older patient with normal but mineralized globi pallidi who then suffers carbon monoxide poisoning, leading to pallidal necrosis. Clearly, the clinical history and other neuroradiologic features beyond the globus pallidus need to be considered when such a morphologic lesion is encountered. Therefore, the specificity of our findings is relevant for a population of patients with NBIA but would not necessarily hold for a wider population of patients with neurodegenerative or toxic conditions. Even after patients with PKAN are excluded, NBIA probably still includes several distinct disorders based on the range of features that are observed. Although the MR imaging findings from this study do not allow us to further stratify NBIA into discrete diseases, the other brain MR imaging abnormalities that were commonly observed in patients without the mutation may eventually lead to better ideas about pathogenesis. Patients with mutations in the PANK2 gene can be distinguished from patients without the mutation by their specific brain MR imaging changes, even very early in disease. The pattern of MR imaging abnormalities in pantothenate kinase-associated neurodegeneration evolves over time and may help to clarify the disease process. We thank the patients and their families and the NBIA Disorders Association for their participation in this work and Chris Hollman for his assistance with data collection and management. This work was supported by a grant from the National Eye Institute. J.G. is an investigator with the Howard Hughes Medical Institute. Tanfani G, Mascalchi M, Dal Pozzo G, et al. MR imaging in a case of Hallervorden-Spatz disease. J Comput Assist Tomogr 1987;11:1057–58. Accepted after revision October 28, 2005.